Old AA2 player looking to start playing casually again. Are people still playing? what days are busiest player wise? Also have another friend who is interested in playing again. Would love to get back into this game! There are still some people playing. However, since the way we used to authenticate users (battletracker.com) is on it's way down and doesn't let you register new users, new users cannot be created at this moment. Some of the admins are working on a fix. The exact ETA is hard to project right now, but if all goes well, there could be something by the end of the week. With that said, if you already had a battletracker.com username and password, login with those details should still work. You can still log on to battletracker.com with your old details (but you won't be able to do anyhting there) and if you managed to do that, the same details work for Assist. Right on! I started to play again in 2015 before they shut everything down. Luckily I made an extra account, and still have my old one as well. 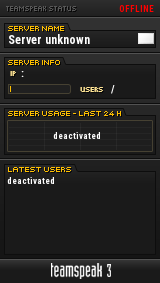 Would love to admin a server, but I think I need better internet to run my own. Anyways, thanks for the help! hope to see ya out there! I am interested in playing - old AA player as well. Just discovered this now wish I knew about it sooner. Unfortunately, I do not have a battletracker account, so I cannot play until the admins find a new authentication/account creation method. Guess I'll keep checking back until then... Really want to play with you all! I'm an old player as well, really bummed to find out I can't play it. Downloaded Assist 2.5 and it said I had to login but I have no idea what my old username/password is. I haven't played since like 2004 or 5. If someone knows a way to play, please let me know I would greatly appreciate it.